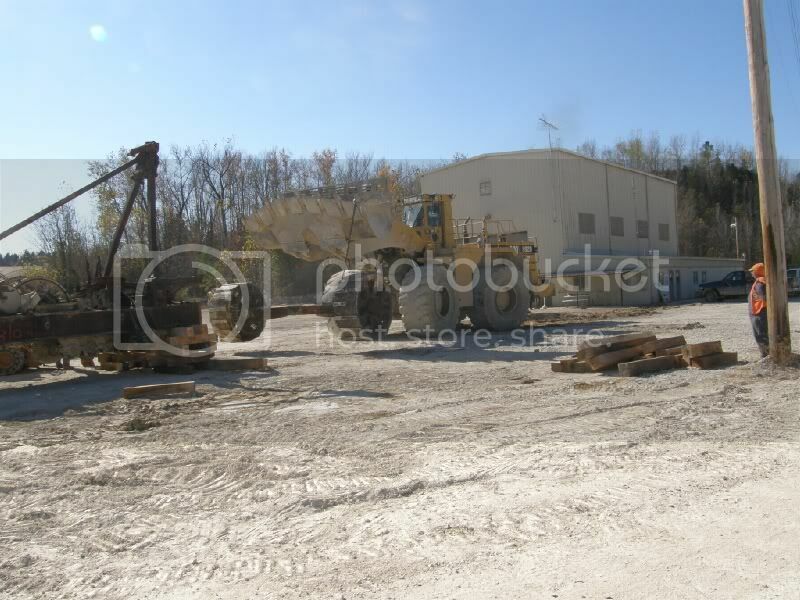 Discussion in 'Marion-Osgood Steam Shovel' started by cjmlarson, Nov 20, 2010. 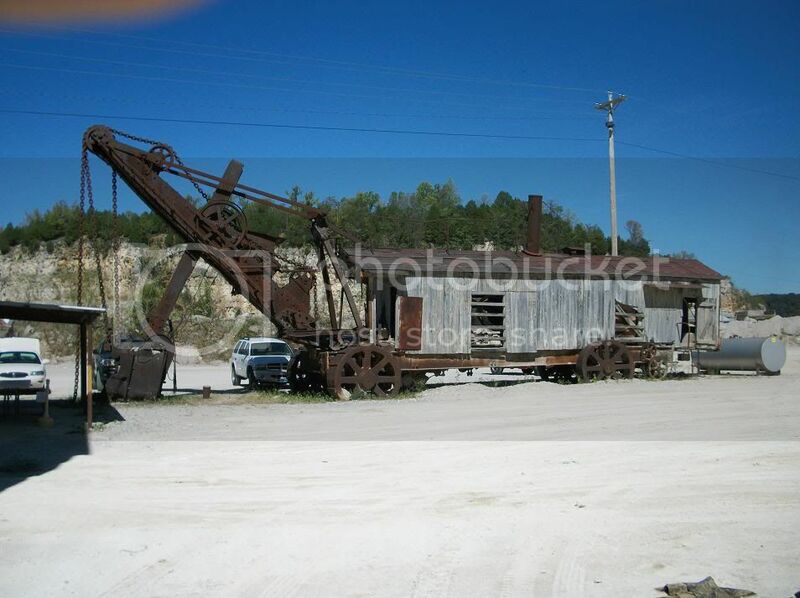 This thread is going to contain information for the acquisition & restoration of the large Marion-Osgood steam shovel, which has been donated to WMSTR by a group in Battletown, KY. This shovel was found by Bill Rudicill over 25 years ago and he has been working on getting this donated to WMSTR for the past several years. Harvey Pelley, who has also been instrumental in this process, will elaborate on the historical details later on in this thread. This fall, all of the paperwork was finally completed that allowed this piece of equipment to be donated. Harvey is diligently working on finding all of the historical information of exactly when this unit was manufactured and where it was used prior to being located at Battletown. 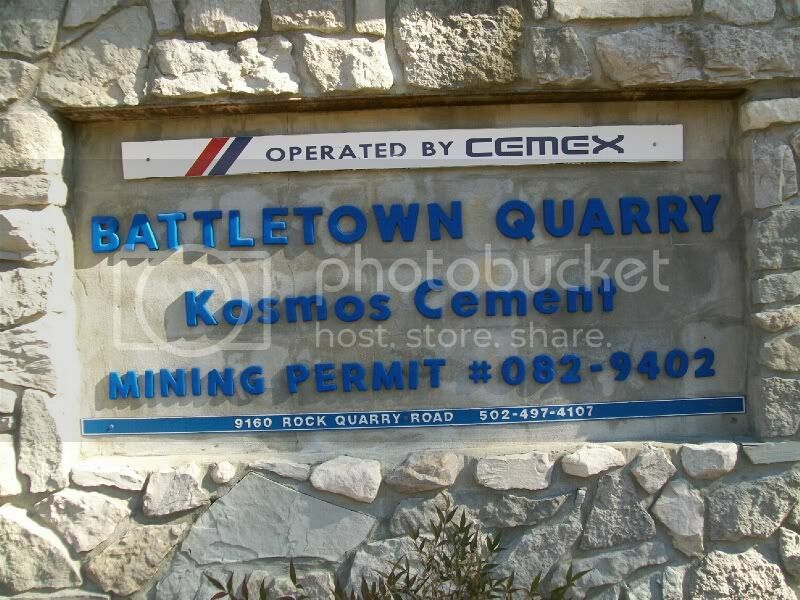 Entrance to the quarry in Battletown, KY where the steam shovel was located. 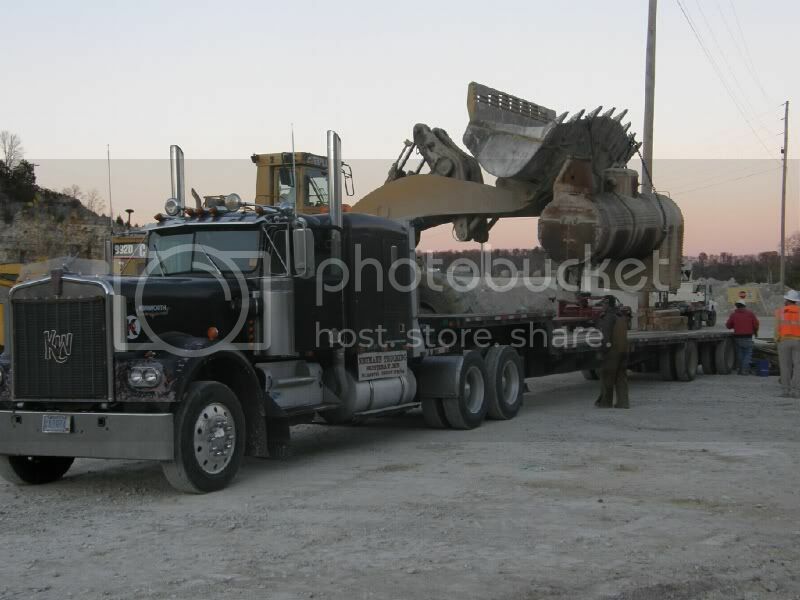 Here is the shovel prior to disassembly for transport. In the past 2 weeks, the disassembly process has begun. 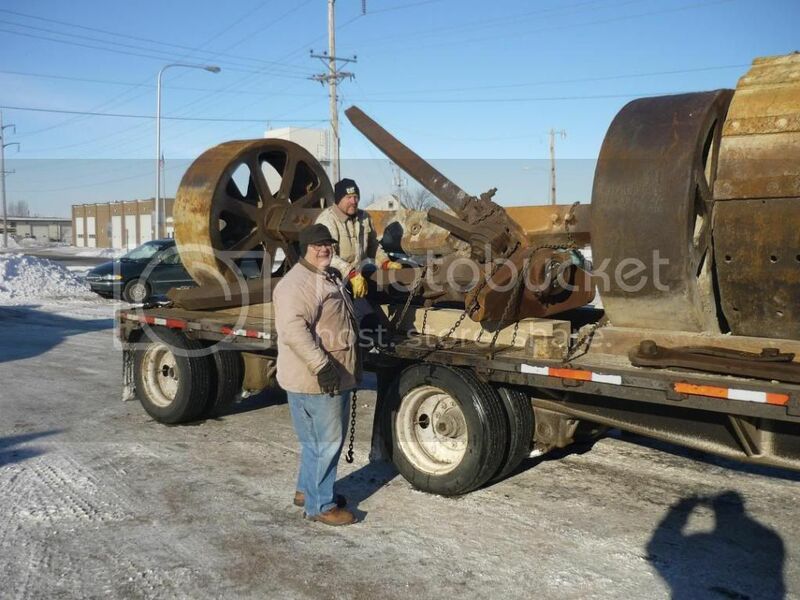 One truckload of parts has arrived, with the boiler & crowd engine being at Larson Welding, and the water tanks and other misc parts are at the showgrounds. 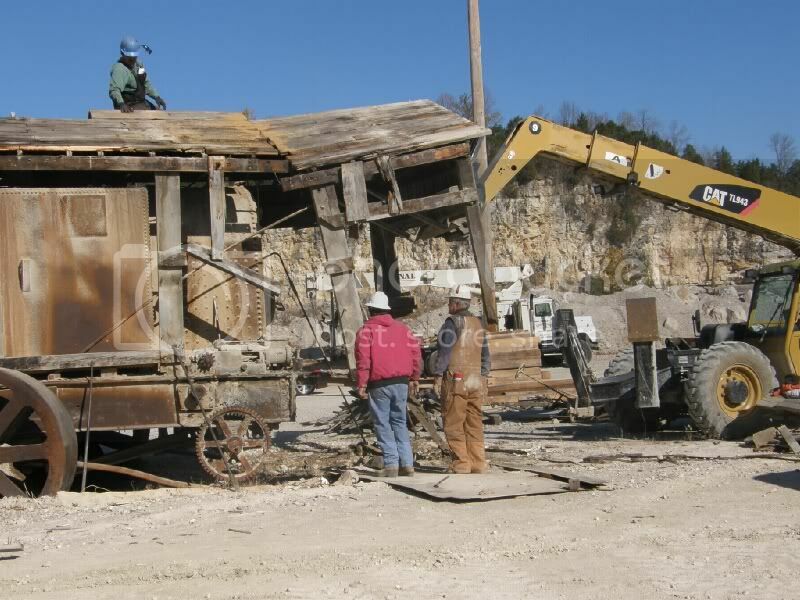 Part of the shovel will stay in Kentucky this winter, and Bill, Harvey & crew will be working on those pieces. More to come soon. Agreed. Wow! That is going to be a sweet addition to the massive machines at Rollag. Left to Right: Ryan, Wimpy, Bill, Clayton & Louie. This picture was taken in Bill's yard on Sunday morning prior to our departure. This fall, the 4 of us drove to Kentucky to look at the shovel. We took still pictures and video clips of the unit, so we had documentation of how to put this beast back together. This was due to the fact, that Bill, Harvey and their crew are the ones that are taking it apart, but they can't be up here during the full assembly process. Can't wait to do the first spark show with this monster... this will forever make the Sandbox "King of the Hill!!!!" Clayton, you must have posed for the JC Penney or Sears Catalog in the past, huh? Can't wait to see this piece arrive - this will be a great addition to the hill! Now I'm curious -how many yards will go in the bucket? Is the chain hanging in front just a broken one hanging there or is it used for something I'm not seeing? Too much turkey -sitting here wishing I was on the hill steaming something up! 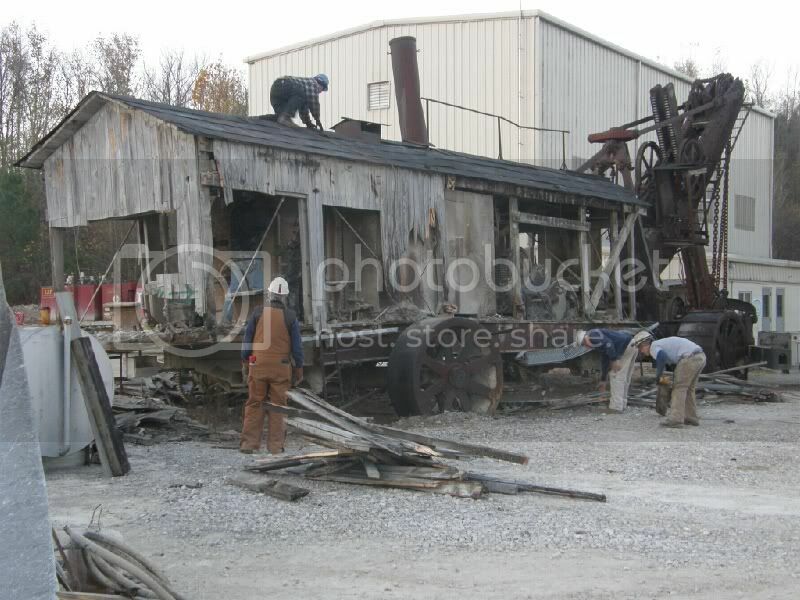 The following pictures are of the disassembly process that the Kentucky boys did a few weeks ago. If you're wondering about names of people, they are listed in the newspaper article that Mark linked to in Post #8. They got an early start on a Saturday morning, well before the sun came up. That is why some of these pictures at the beginning are dark. This is quite impressive, how much was accomplished in one day. The first order of business was to dismantle the house from the car body. Here they're marking all of the metal roof panels that will be re-used when the new house is built. 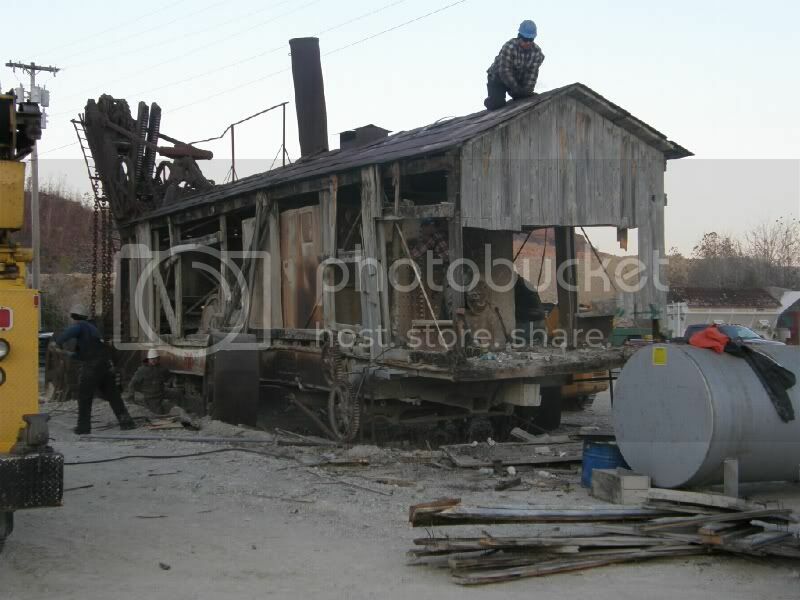 Here they are removing the rear section of the house. This is where the fireman would stand while the shovel was in operation. Just a shot of how the roof sections were removed during disassembly. 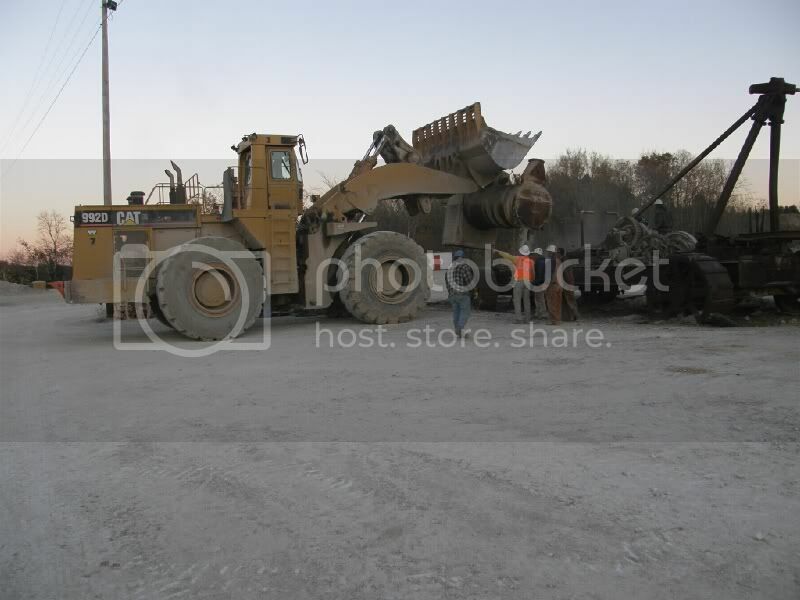 This is what it looked like with the house completely removed. They are now ready to start lifting the iron pieces off of the car body. Guys & gals...do you think there is some work involved with this disassembly process?? Neat Relic! Its restoration will be worth making the trip back to Rollag! The Historical Construction groups will be jealous of this piece! The boys are removing the left-hand water tank. 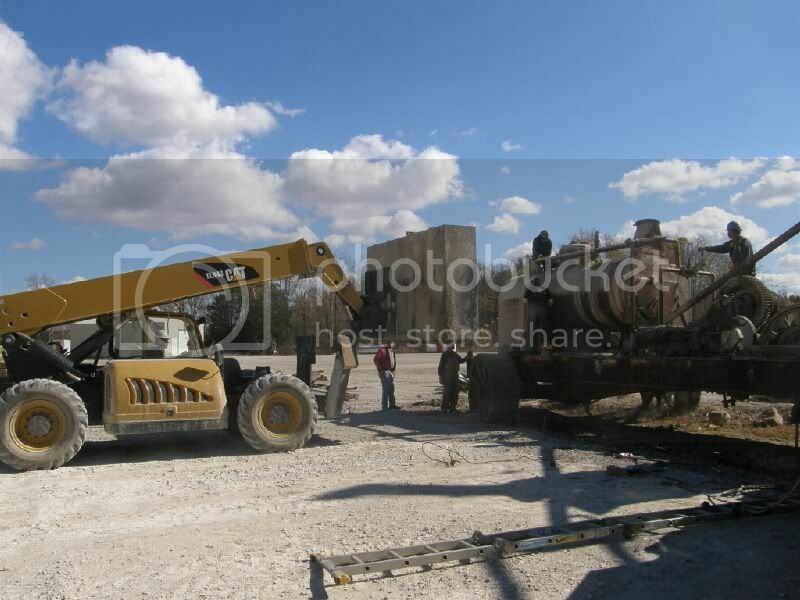 Here they're removing the right-hand water tank. These water tanks sit next to the boiler on each side. You cannot get from the back of the house (fireman's area) to the front of the house, without going outside of the house and walking on the catwalk to the front. There was no problem with the lifting power they had available. 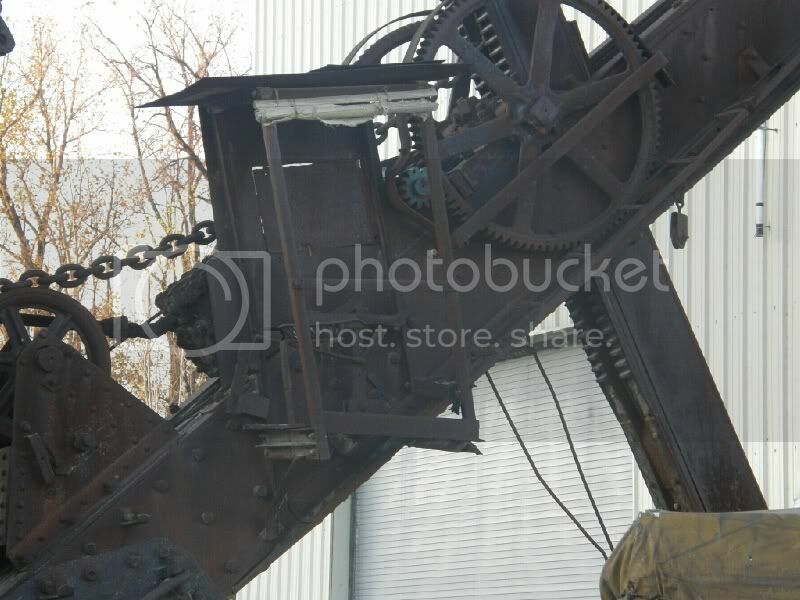 Here they are getting ready to cut some bolts and remove the dipper. 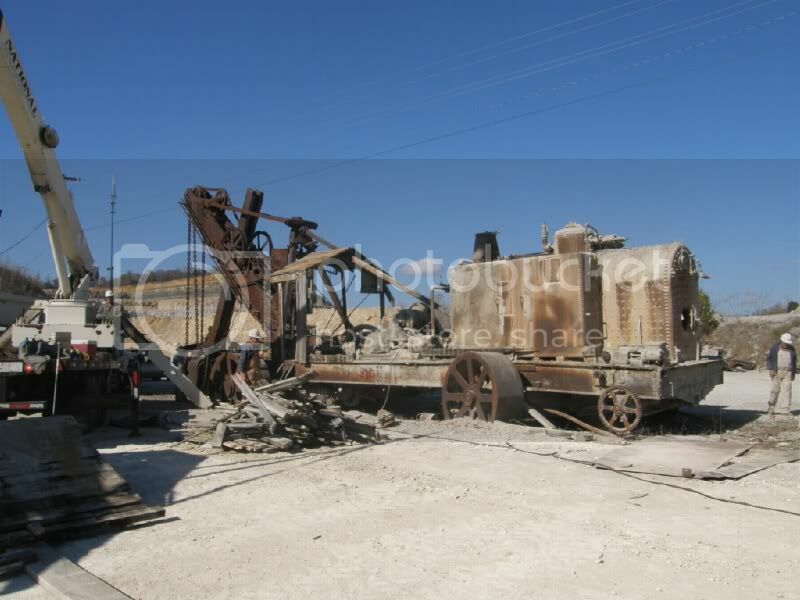 On these old machines, in the center of the iron channels there are big wooden beams. So in the process of cutting bolts off, these sometimes start on fire, due to the fact that the wood has had plenty of time to dry since approximately 1910. This is what you see smoking on the picture. Next to come off was the boom. 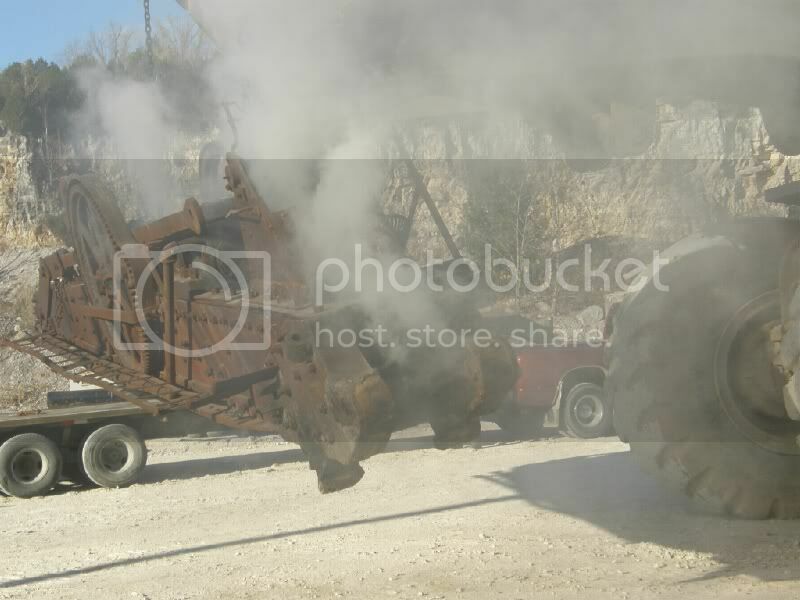 The guys in the quarry helped run the loader, which was sure nice, due to the fact that there was no problem with lifting the heavy piece of iron. 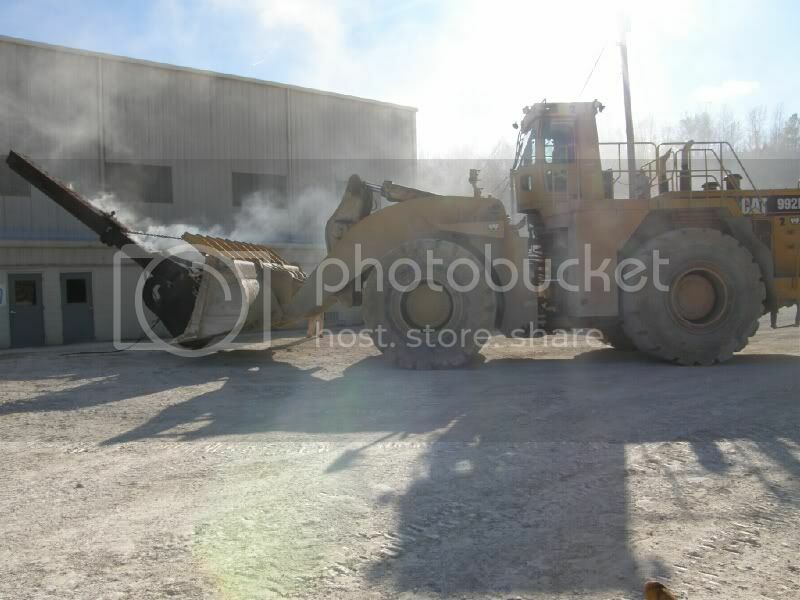 Here you can see the wooden beam is burning on the boom also. They did eventually get the fires to go out. Thanks, Clayton, for the pictures and explanations - very interesting! 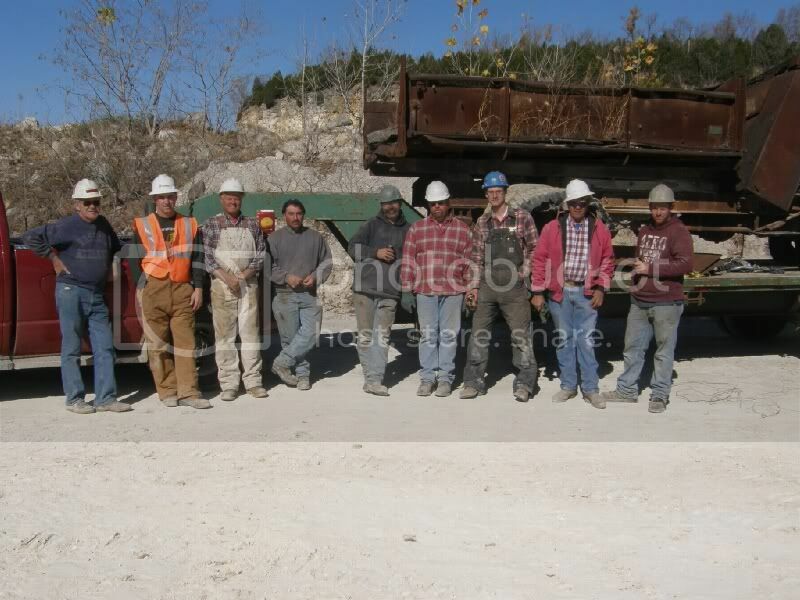 Here is most of the crew that was working on the disassembly process. I am not going to put names to the crew, as I do not know all of them and don't want to leave anyone out. This picture should have been posted earlier, but this is the crow's nest where the person that is operating the dipper sits. 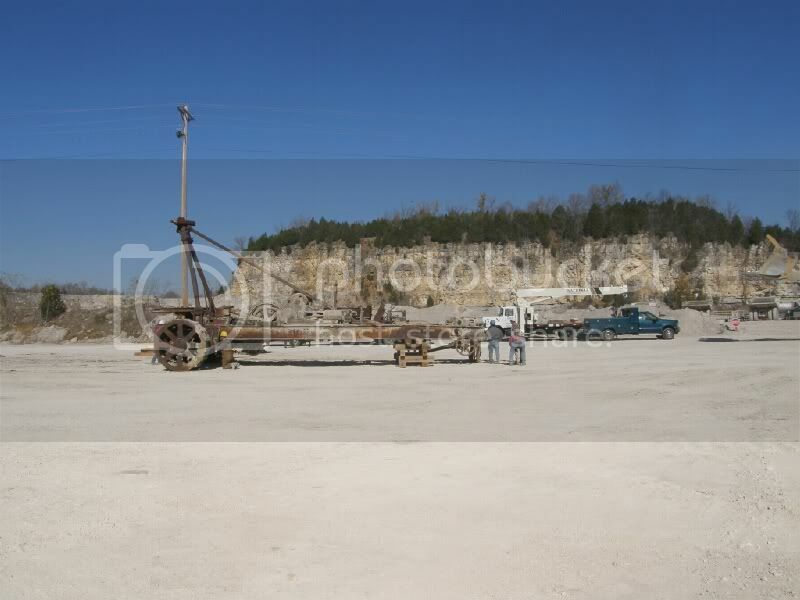 It is on the right hand side of the boom, part way up the side. I'm not sure who we're going to get to sit in this seat. 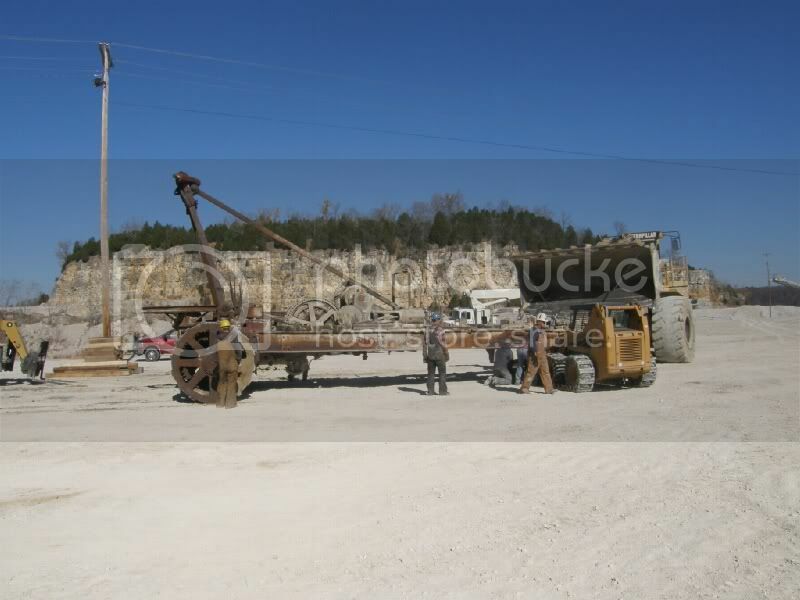 This is the crane they were using for some of the disassembly. But when they went to lift the boiler off with it, they found that the boiler was too heavy for the crane so they had to go to Plan B. 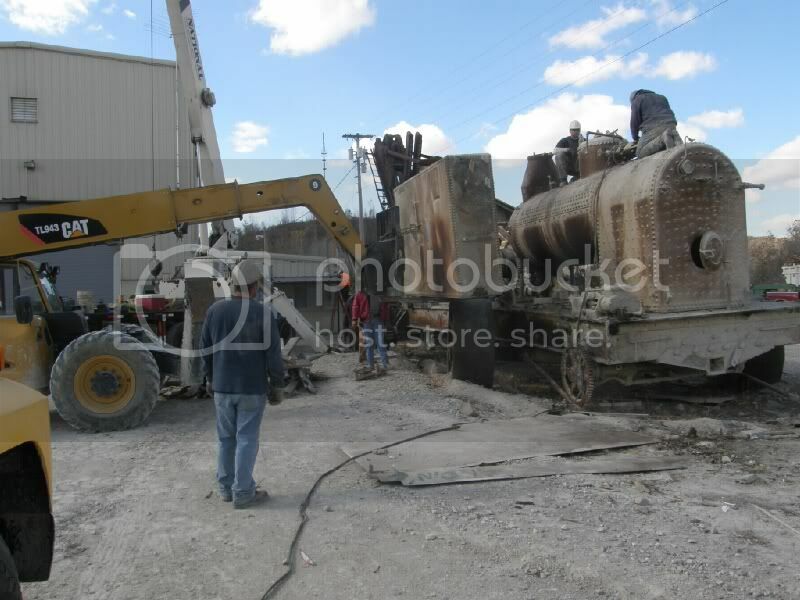 This shows Plan B lifting the boiler off the car body. 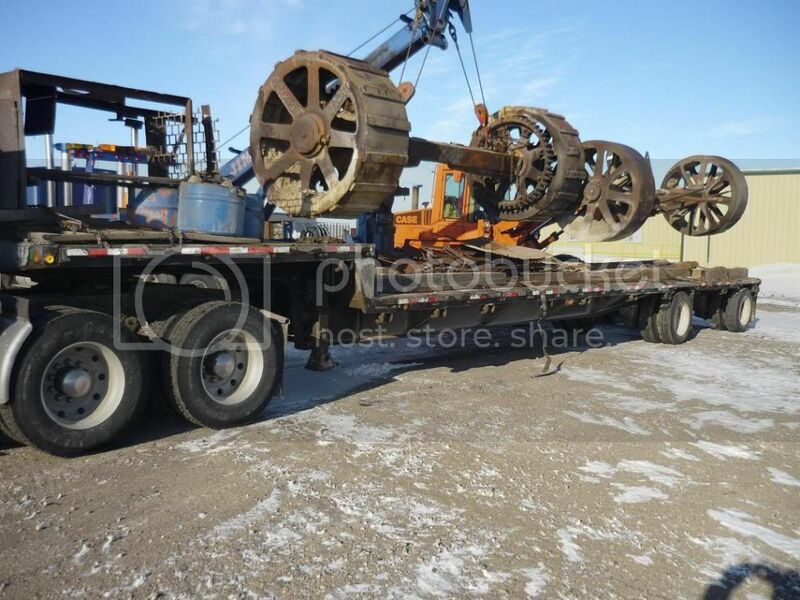 Starting to load the truck with the pieces for the first load to Rollag. 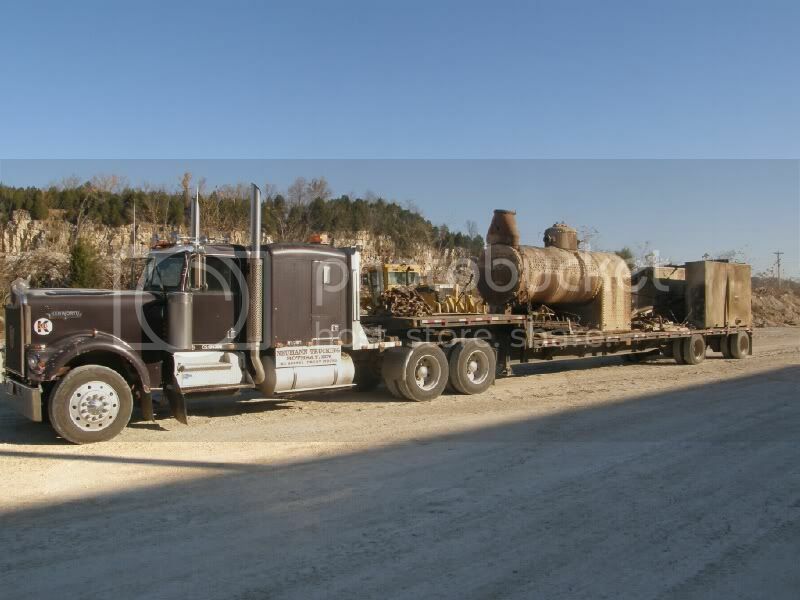 Here's the truck with the boiler, the water tanks and some of the misc parts, ready to make the trip to Rollag. Here the car body is blocked up. Only thing left on this is to remove the axles, which will come to Rollag, and the car body will stay in Kentucky for the winter to be rebuilt. Here they have the car body blocked up and are starting to remove the axles out from beneath it. 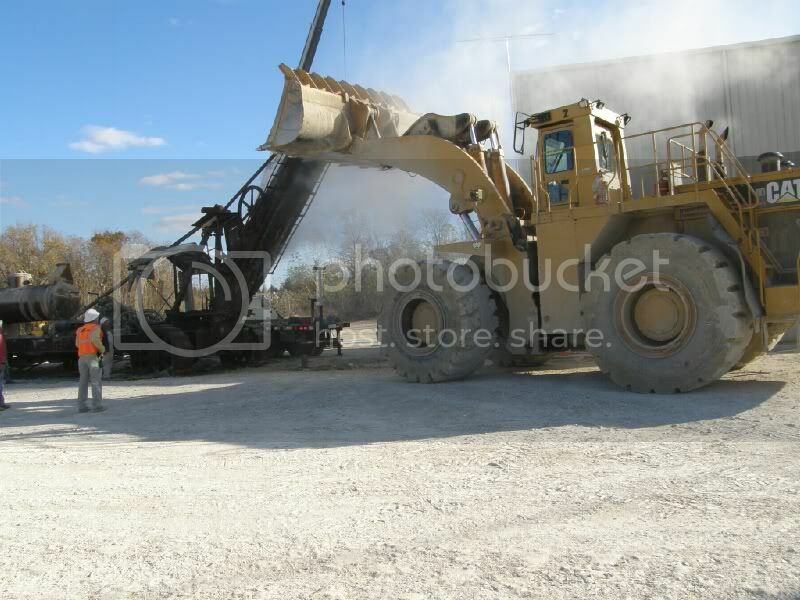 As you can see in all of these pictures, it was sure nice to have the quarry lend a helping hand and use their loader to lift all of these heavy pieces. This was much appreciated. That dipper seat could be filled by Danger Boy!!!!!! That looks way more DANGER then runing you edger. Should I change my avatar to the Osgood dipper seat? This was my mistake, as I was looking through the photos, I realized these next 2 pictures had gotten out of order. But you should be able to figure it out. Here they are starting to remove the steering axle from the car body. It's a little dark, but this is the car body with both axles removed from it. Only thing left is to remove the A-frame from the front of the car body. 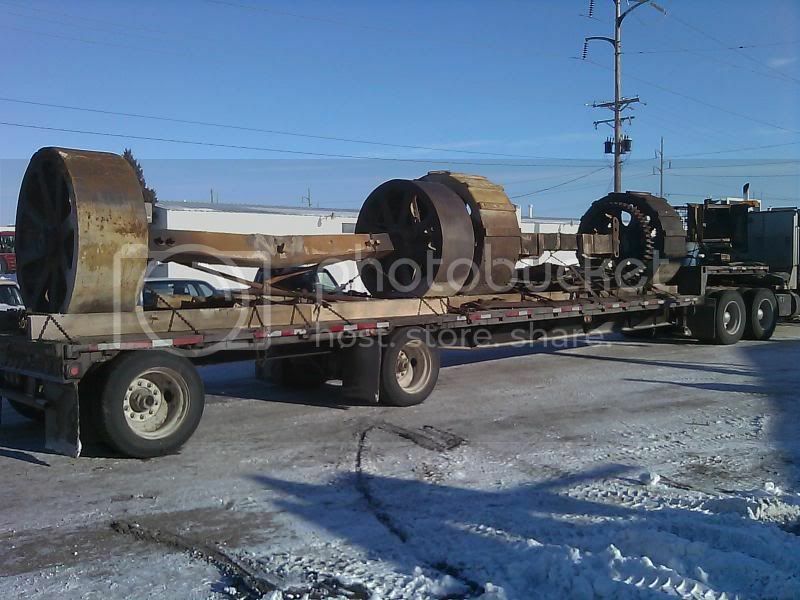 When the load of axles showed up at Larson Welding, I looked at them and told Wimpy, "I think they have grown since our Kentucky trip last fall". He agreed, as they sure looked alot bigger when they were out of the holes they had been sitting in since the 1950s. 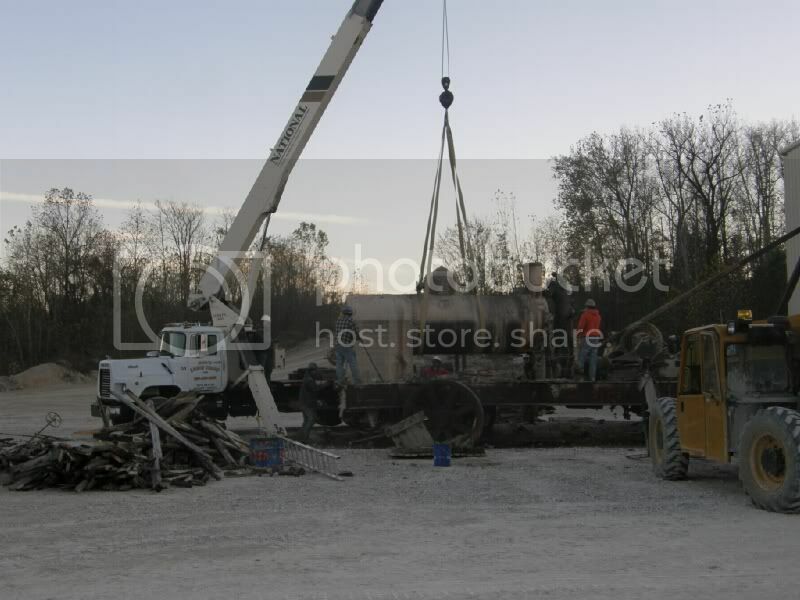 Jim B, Wimpy, myself and George (Jim's Towing), then unloaded this load over at George's. 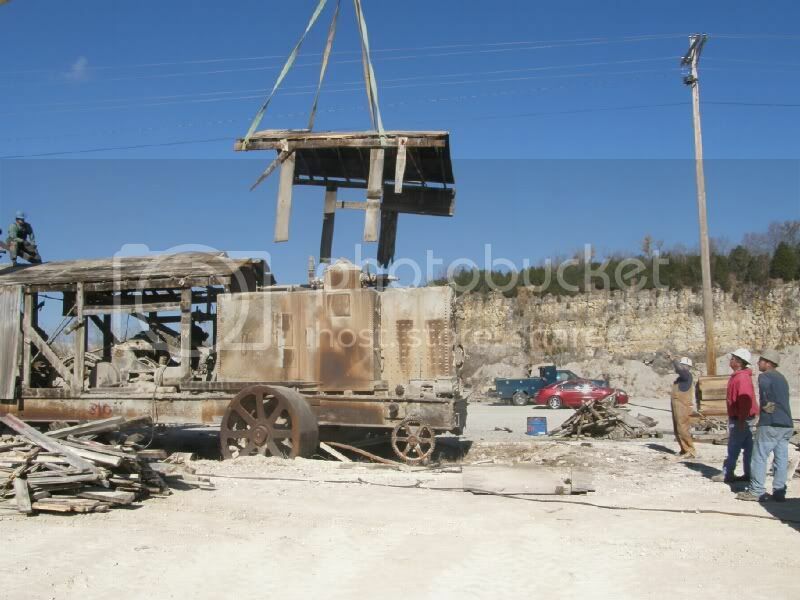 We used George's loader and one of his big wreckers and lifted the axles up and drove the truck away. 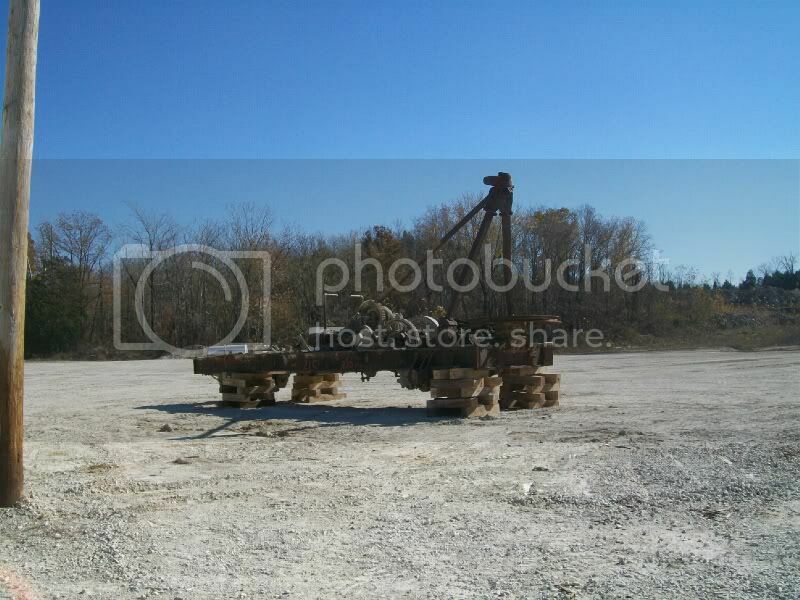 We then set the axles down on the ground. 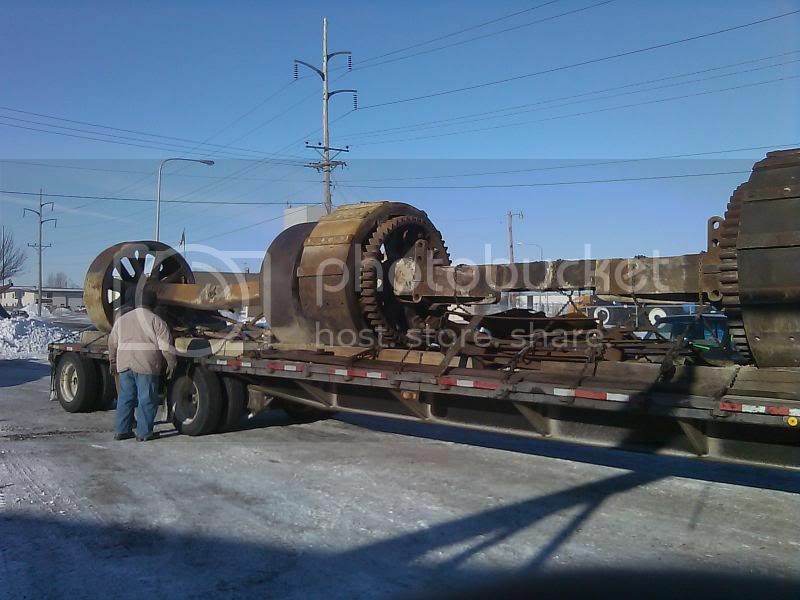 Just another shot of the mammoth axles on the truck. 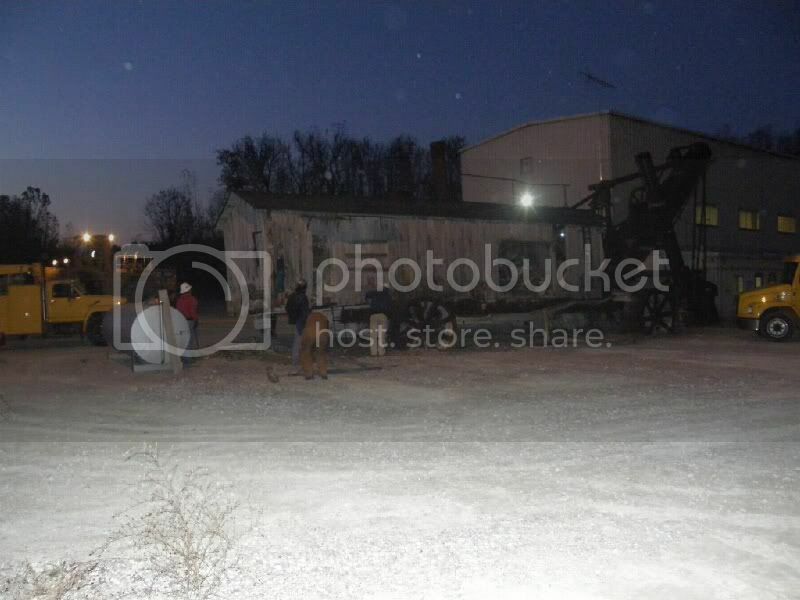 Here Wimpy and Clayton are taking the chains off of the A-frame so they could unload that at Larson Welding. The A-frame is the piece that is in front of the house, but behind the boom on the shovel. 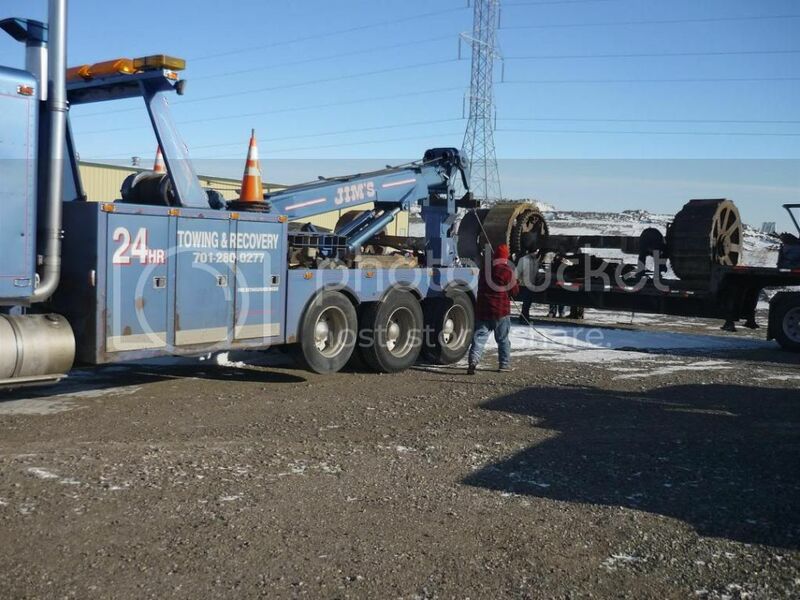 Here George (Jim's Towing) is lining up the wrecker to get ready for us to hook chains to the big axle so he could lift it up. 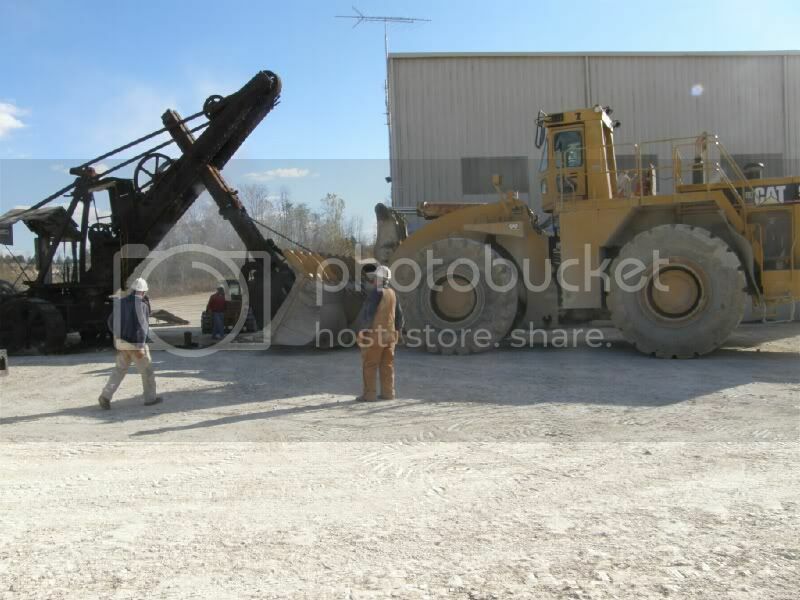 Here George is lifting the drive axle up with his wrecker and we used his loader on the steering axle to lift that up. Then we drove the truck forward so we could set the axles down on the ground. 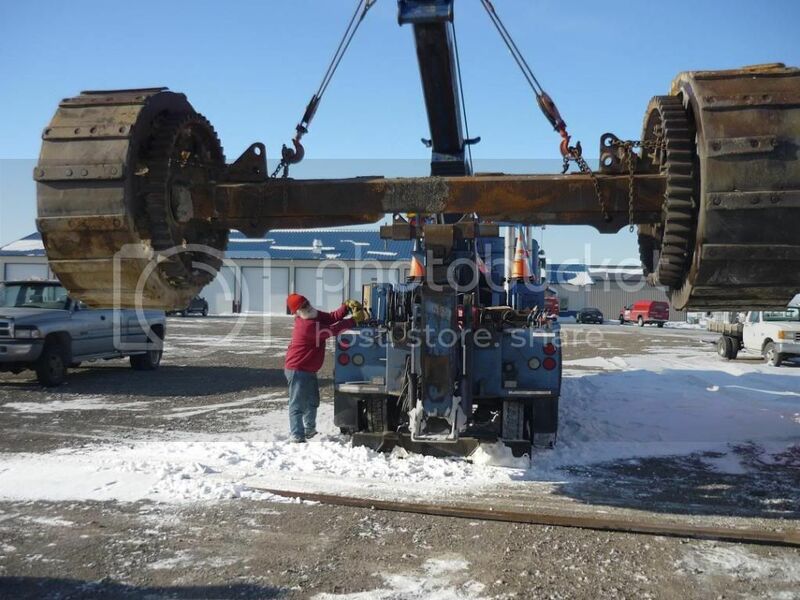 This picture gives you a pretty good idea of the size of the drive axle. George is starting to lower it down to the ground. We'd like to give a big thanks to George for unloading and storing the axles over the winter, until we're ready for them next spring.